Until July 30th 2010, all of the content published by the Royal Society is open access to all. Dig into it while you can! Some of you will know I am a fan of older and ‘ancient’ science. 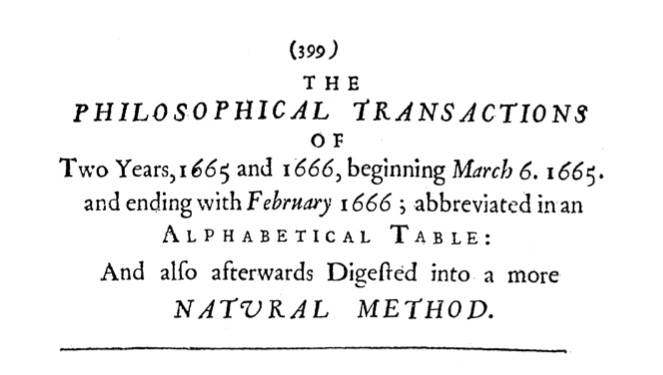 I’ve previously written that some older works from the Philosophical Transactions are available to everyone via their Trailblazing website. In similar fashion, older science articles are available on-line elsewhere. 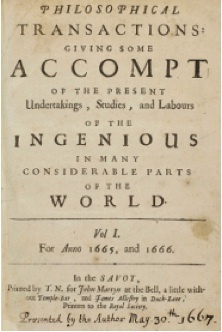 The Royal Society provide lists that highlight a small selection of the older works from the Philosophical Transactions and the Proceedings of the Royal Society of London. These are a treasure trove of correspondence and articles to explore, as looking at the first issue of the Philosophical Transactions shows. If you are reading these, it pays to read on down past the article that caught your attention. They are presented as a collection of correspondence; further remarks are often to be found later on. The Motion of the Second Comet Predicted, by the Same Gentleman, Who Predicted That of the Former. A Relation of Persons Killed with Subterraneous Damps. Observables upon a Monstrous Head* is immediately followed by Observables in the Body of the Earl of Balcarres,** surely a truly awkward juxtaposition of titles even in the day. The front and back matter (see below) for each issue are available from the table of contents pages. A Way of Preserving Birds Taken Out of the Egge, and Other Small Faetus’s; Communicated by Mr. Boyle– to a rushed reading – appears to be describing the preservation of soft tissue in alcohol (referred to as ’Spirit of Wine’). A Relation of an Accident by Thunder and Lightning, at Oxford provides account of a thunder storm and the fate of two students of Wadham College, Oxford, to lightening strike. It’s a detailed narrative and well worth reading. It is interesting how anecdotal many of these accounts are, informal correspondence compared to today’s science. There is so much there that if you can’t find something that intrigues you, I won’t know what to think. * More correspondence on the fÅ“tus-in-fÅ“tu or teratoma. ** A brief report on the dissection of one Earl of Balcarres. *** Also, a Royal Society representative has asked for suggests as to what to highlight. Let us know if you find something that others might like. Thanks for all your highlights Grant, they’re fabulous! Sorry I didn’t get back sooner. Busy with work, trying to get my latest post out and deleting spam! Want to find time to have a decent browse, but not having a lot of luck. Hope others are making the most of it, though.